New York is the epicentre of the American business world. . 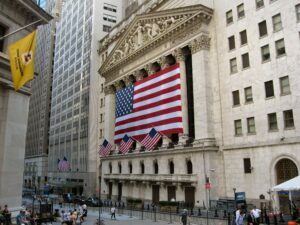 The main stock market of the world is located here, the New York Stock Exchange (Wall Street) but also the NASDAQ stock market, where many newer companies trade. Wall Street is the financial centre of Manhattan. The city acts as an enormous engine for the international economy. There are more head offices of Fortune 500 companies located here than anywhere else in the United States. Tourism is also an important source of income for New York. In 2010 there were 49.7 million visitors, that spent $31 billion in total in New York City. The average price for a hotel room was $250 per night.